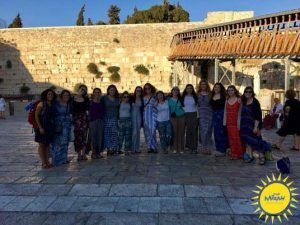 Micah In Israel: First days in Israel! Shabbat Shalom Camp Micah! We just arrived in Israel after spending four days in Poland. There, we visited many historical sites which opened our eyes to our culture’s history. We first visited Kazimierz, the old Jewish quarter of Krakow, and explored life before WWII. After learning about Jewish life in Krakow, we visited Birkenau, Auschwitz, and the remains of the Warsaw ghetto. Through all of the difficult and emotional times, we managed to stay positive. As we waved goodbye to Poland, we reached our flight to Israel with less than 5 minutes to spare, and are now enjoying the beautiful city of Jerusalem. We enjoyed a gorgeous picnic with our group leaders, Yael and Dohr, sang songs, and enjoyed an amazing view of the city. We then got ready for our first Shabbat together. The counselors led the group on a short blindfolded walk through the old city to a balcony. 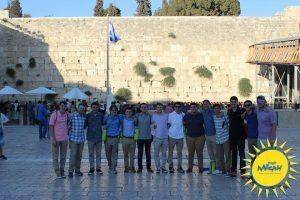 When the blindfolds were removed, the group was overlooking the western wall, many for the first time. It was a special moment of appreciation and excitement. We then got the chance to walk down to the wall for the first time. With Shabbat rapidly approaching, we headed back to the hotel for a candle lighting. We then had a lovely Micah style shabbat service, led by Lexi Tuch and Jonah Berg. After a feast of a shabbat dinner, the group had some down time and a good night’s sleep (late wake up!) We’ve spent a relaxing shabbat filled with group activities and pool time. We’re excited to head back into Jerusalem tonight for some time at the Mall. Stay Tuned! Also, please check out the Micah Facebook page for pictures of the first week! Soon, we’ll write to you from Tzfat!